When I've been to London during this time of year, I've always enjoyed the Christmas shop at Fortnum & Mason's. I still have a wonderful ornament that I bought there. Those are lovely baubles! They would make for some fancy, elegant Christmas decorations! I love the Christmas markets! Those are lovely Christmas balls! I broke something in a store once too, it was horribly embarrassing, but it was a poorly made candelabra with lots of glass candle holders in it and they didn't make me pay for it or anything because I actually wasn't the first person to break one. Oh they are beautiful. You make Christmas shopping look like a fun adventure. I like the mix in colours. Wow, that's such an amzing photograph!! Beautiful!!! I've done most of my shopping already and lots of baking too...but still I dont feel much of the christmas spirit yet.. 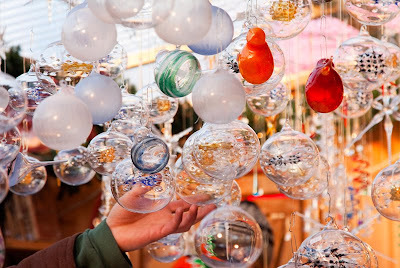 Pretty glass baubles-bubbles! They must look fantastic on trees with lights. You caused an explosion? Eek is right. I always try to avoid glassware sections everywhere. Lovely photo and pretty baubles, but stay well clear Mo! Lovely shot of the baubles. So... how spectacular was that explosion then?! Care to share?